The weather this weekend took a distinct dip towards Autumn: dark, rainy with chilly nights prompting discussion about whether it would be ok to turn on the heating, it would not. Although the rain has moved on and the forecast is for sunshine, those clear skies will bring a risk of frost which will mean farewell to many flowers. 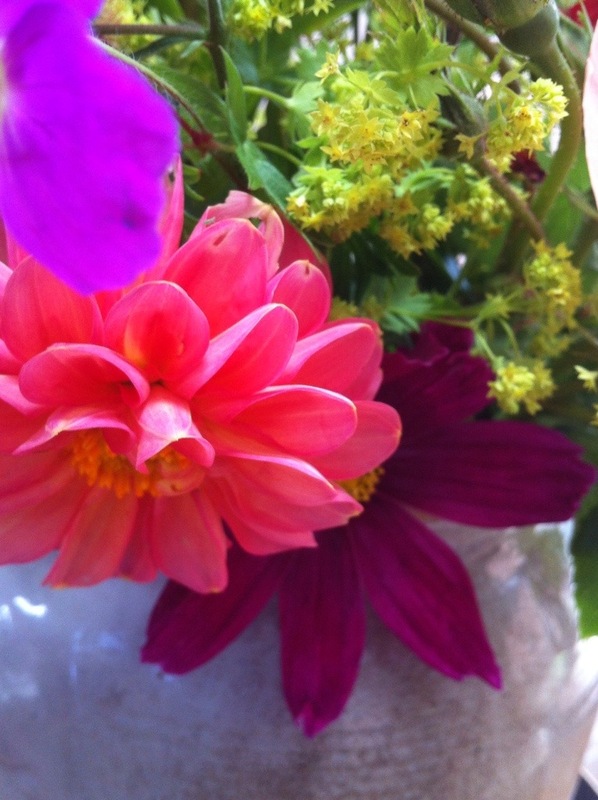 A pick from roses, Zinnias, Verbena and dahlias were available on Saturday. I used them to brighten the table for dinner. These are my flowers to join Cathy. 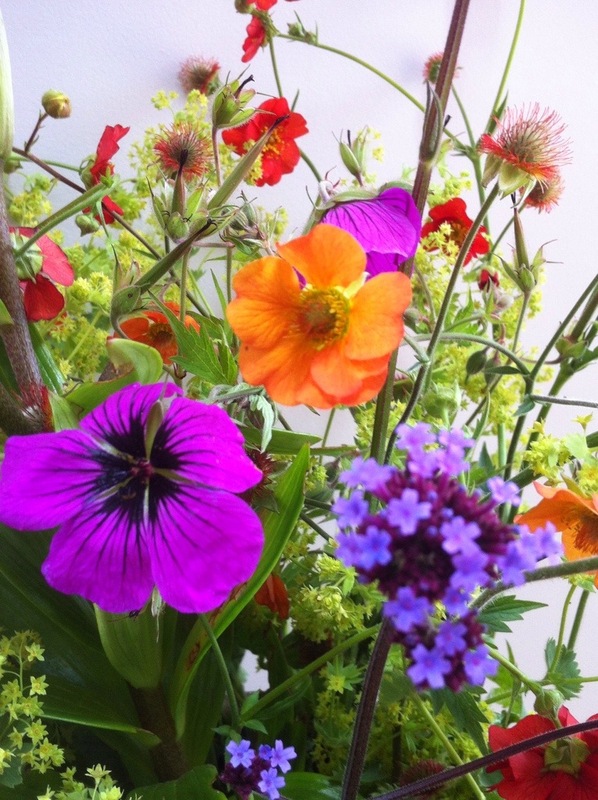 Do you have some flowers from your garden to share? Do join us and send a link back to Cathy. D.
I am joining Cathy today with not one but two vases of flowers. My garden has recovered itself after the heatwave and things like Astrantia and Persicaria affinis have reappeared. In addition to these flowering, roses are also having a second show. The later flowering Coreopsis, Dahlias and Zinnias are also flowering. 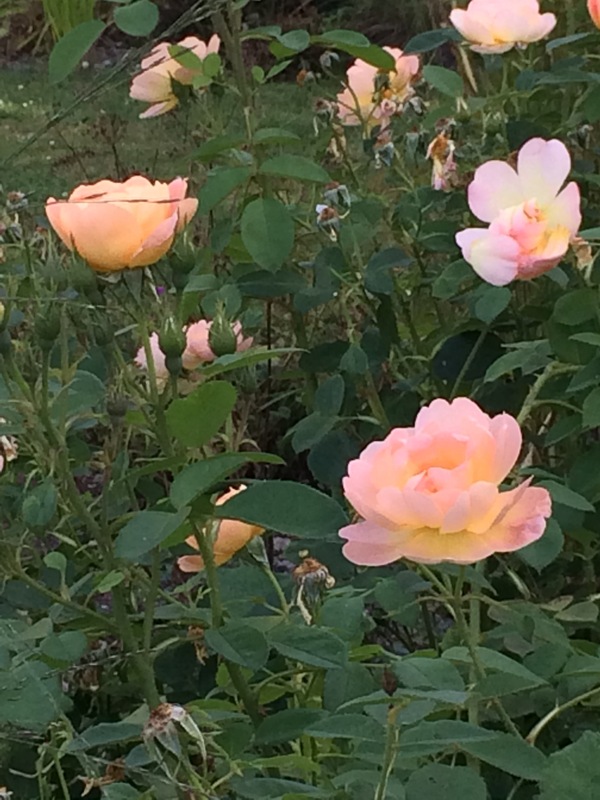 Front left is my favourite rose Lark Ascending next to it the petal full, pink A Shropshire Lad. From left is an open Shropshire Lad, pink and lilac sweet peas, no idea which they are, sorry. In the middle is a soft pink Zinnia with Astrantia behind. I am not completely sure which Astrantia this is as it has self sown, to its right is this rose, so pale it is almost white, Gentle Hermione. 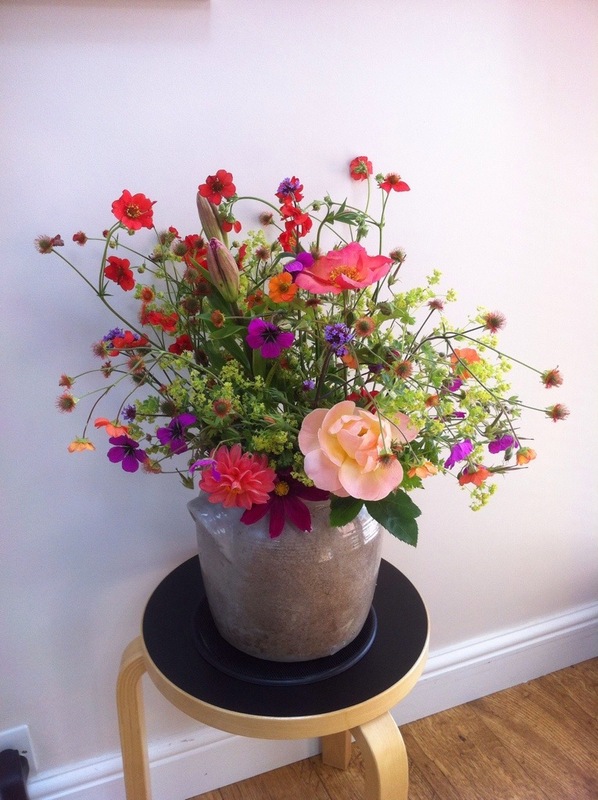 By way of contrast the next vase has the Dahlia William Morris, Coreopsis Moonbeam and dark coloured Zinnias. Added to this group is Verbena bonariensis which is making a bid to take over my garden. Worse things could happen. Have a great week and do check out Cathy’s blog. 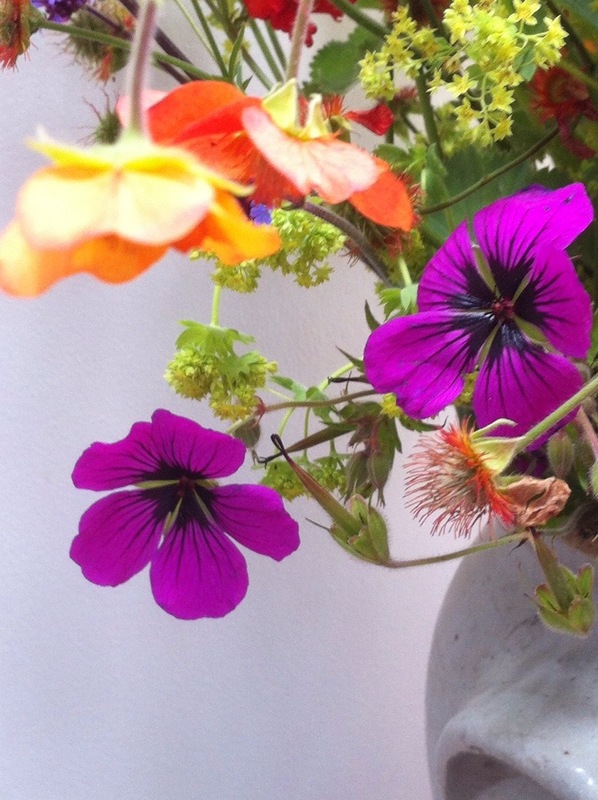 The link is above, to see other Monday vases full of flowers from all over. What a nice way to start the week. D.
This Summer is showing itself to be, dare I say it, good. Warm, dry and sunny. The garden this morning looked rather nice in the slightly cooler air and before the direct sun hit. Whatever is making you smile today, enjoy it. Right I am off to paint yet more wood. More about that another day as it is not making me smile. 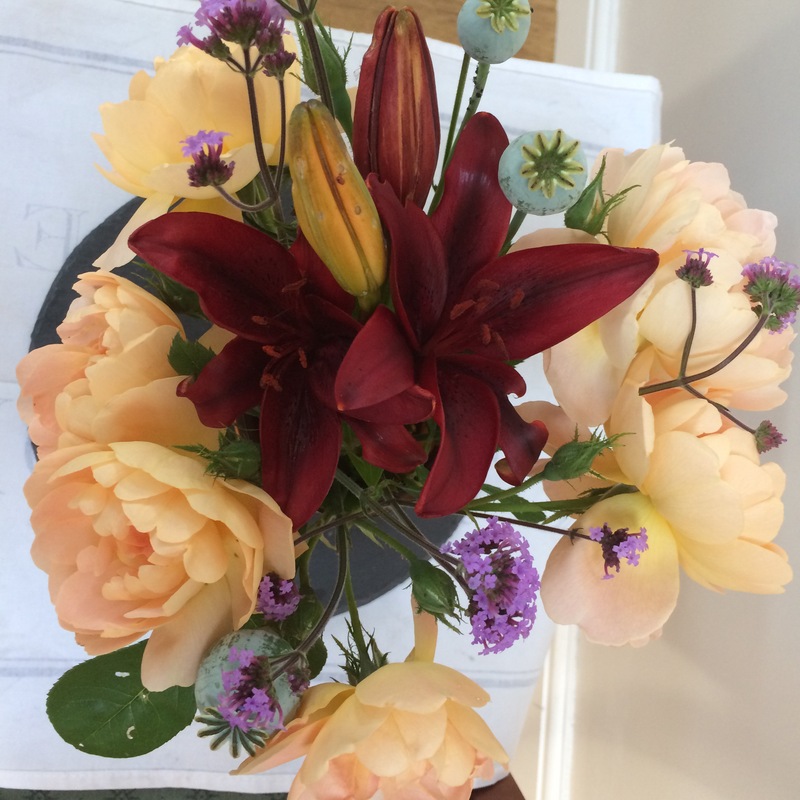 Cathy is the host of this lovely weekly feature and those of us who take part or who read the posts know all about the exquisite selection home grown flowers can offer. 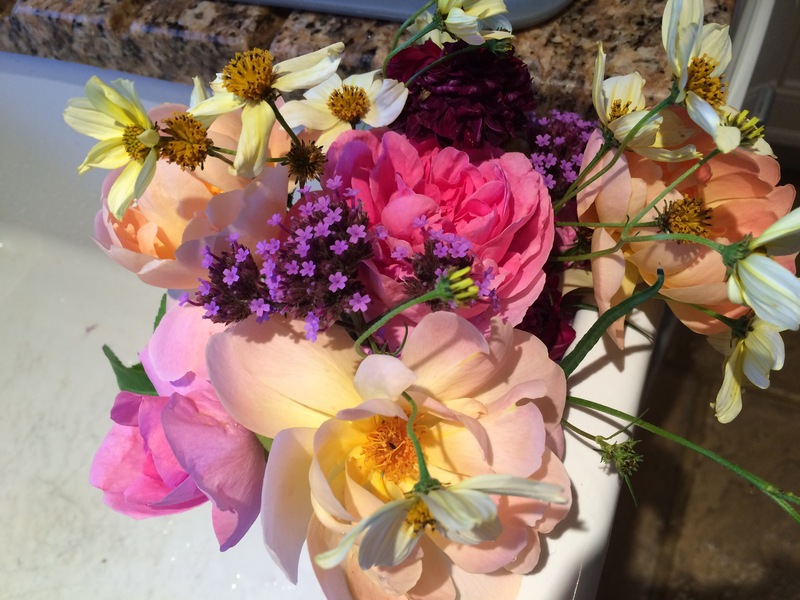 With this in mind I would like to share my British bunch, grown and picked by me. Just as normal really! The centrepiece to the bunch is an extraordinarily dark lily. 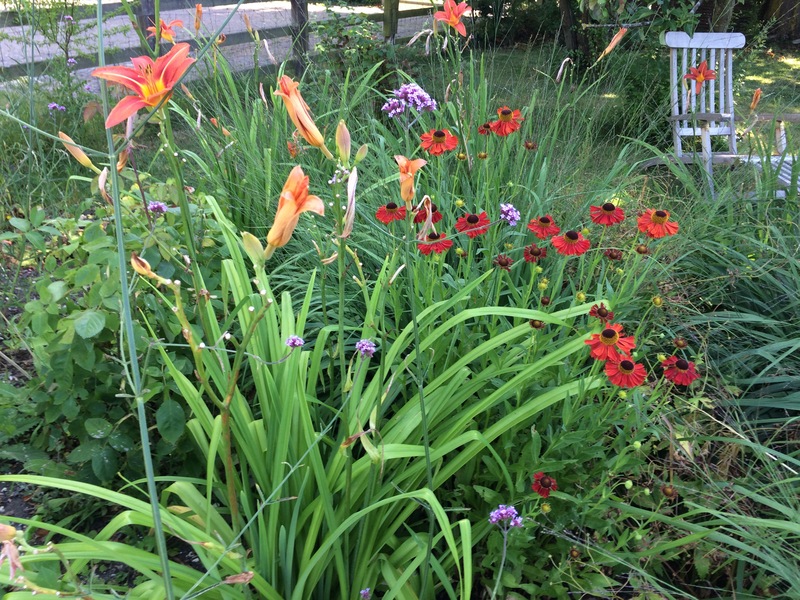 I grow a number of lilies in a raised bed and just leave them to it. This year the lily beetle has found them and I had to strip the leaves as they were covered in a black gunk. The flower seems to be untouched so I think it’s fair to say I got away with that one. Interestingly, well to me anyway, is that the buds of such a dark colour lily are an orange tone. With this in mind I chose Rose Lark Ascending. I cannot praise this (David Austin) rose enough, it’s a firm favourite. 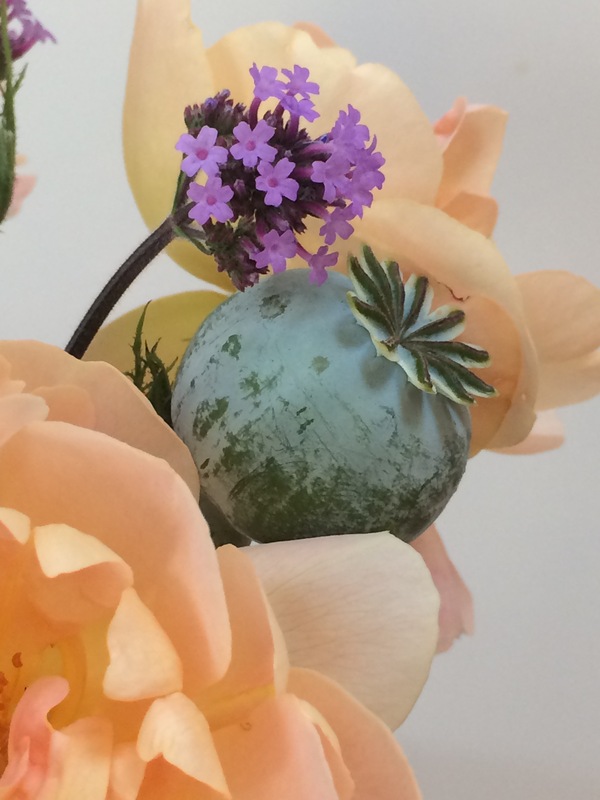 It picks up the orange lily bud in a soft tone of orange to which I have added a few sprigs of vibrant purple Verbena bonariensis and some soft green grey poppy seed heads. All that was left was to decide on a vessel. It had to be the orange brown apothecary jar as the colours seem to work. The weather here is full on Summer reaching a sultry 29 degrees today. Incredible and dare I say it, not very British. The flowers are though. Those of you who saw my earlier post of Silent Sunday must be rather bemused by my confusion over what day it is. You are not wrong. I lost track. 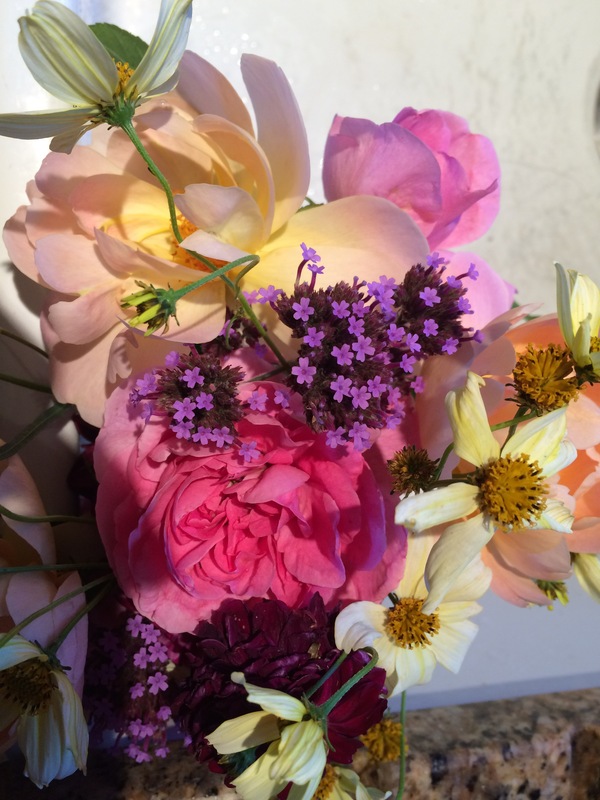 Hastily I put together a bunch of garden flowers to take to my friend Liz last night. Not in a vase but tied together with purple twine. Included are two roses, the pink is strongly scented Gertrude Jekyll and the pale apricot one is Lark Ascending. 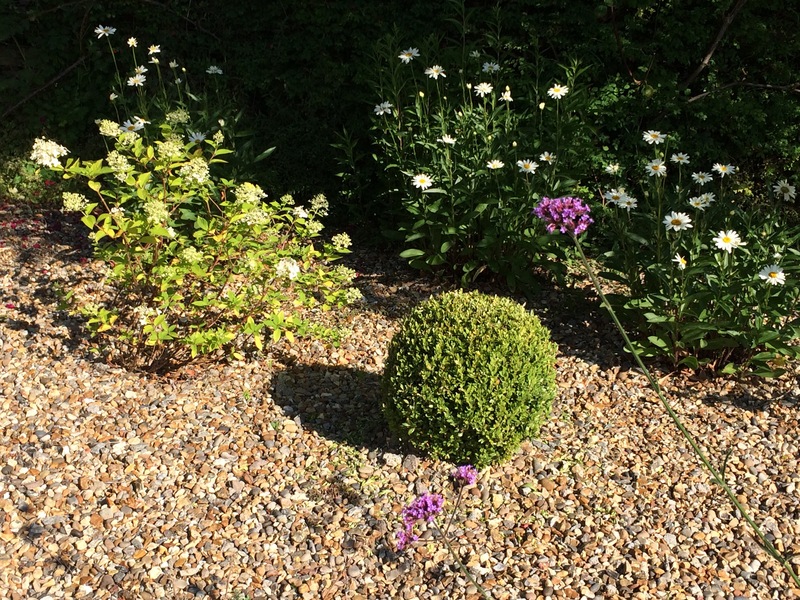 There is Verbena and a pale Coreopsis, darks are from the small Dahlias, mignon and Arabian Night. A row of flowers comprising dark pink Cosmos, small terracotta Dahlia mignon, Dahlia Arabian Knight, Rose Lark Ascending and the tiny white Dahlia whose name I have lost. It was late in the day when I got the chance to put this together and so the light was poor and electric light has tainted the colours. Not much I can do about the light but I can pull the line into a group thanks to the flexibility of the vases, my favourite by Tse Tse. 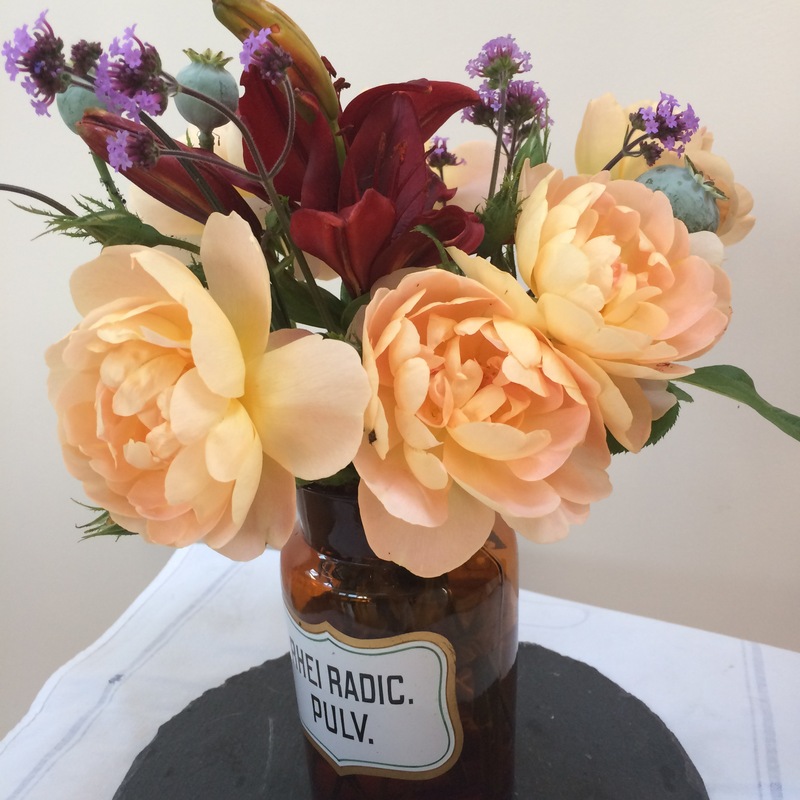 I am off to take a quick look at some of the other Monday vases on Cathy’s lovely blog https://ramblinginthegarden.wordpress.com Did you get chance to look at them? I am linking with Cathy of https://wordsandherbs.wordpress.com to share my view of the the garden as it develops and changes through the seasons. This Tuesday is a beautiful Summers morning and yet still rain is forecast for later in the day. Thalictrum Elin is a fabulous addition to my border, reaching up to 2.3meters. The top of the flowers can be seen clearly above the fence line on the roadside. That may not seem very interesting but to me, where there previously has been no garden at all, this is exciting. I actually prefer the plant at this bud stage before the flowers pop open as its colour changes to a creamy yellow. The Joe-pie weed Eupatorium purpureum is the large leaf perennial in the foreground of the first picture. It too will grow tall, up to 2.5m generating pink fluffly flowers on stout stems. I chose it for its height and its suitability for a wildlife friendly garden. Even the common old fox gloves Digitalis purpurea are tall this year. 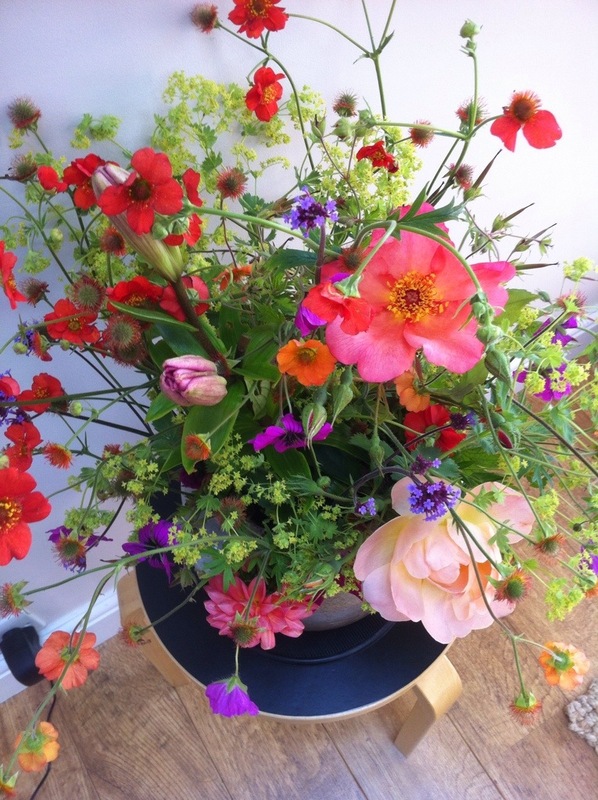 The stronger orange on the corner of the bed is the so called ‘rascally’ Geum ‘Mrs Bradshaw’ (so called by Cathy at ramblinginthegarden.wordpress.com after seeing it yesterday in my vase on Monday). The garden is full and some of the plants are reaching their peak. Roses, grasses, foxgloves, astrantia are wonderful right now. 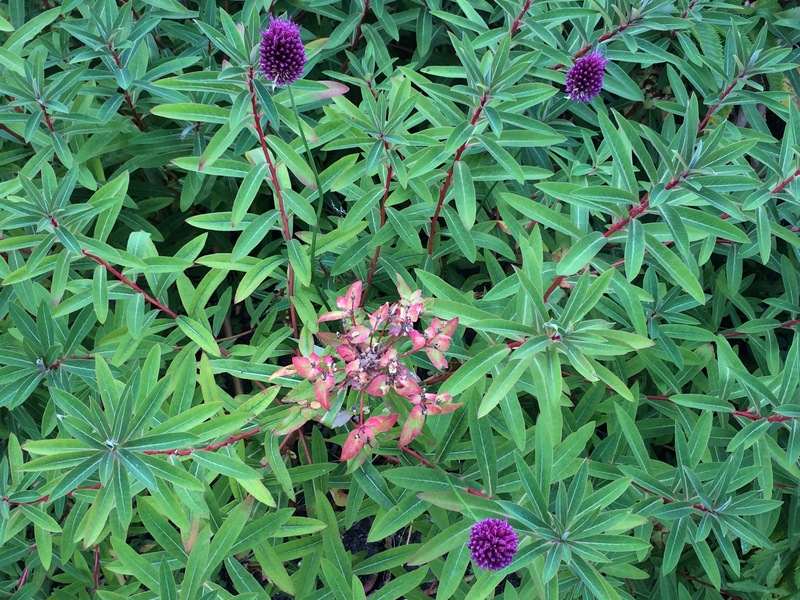 What is looking great in your garden? If you would like to join in with sharing your Tuesday view, do join Cathy at wordsandherbs.wordpress.com and be sure to make a link back to her page. Where is the heat to this Summer? The weather pattern is unsettled but to me it seems to be very settled, settled into a routine of much rain followed by a few warm hours each day. The weeds are growing well, not unlike Jacks beanstalk. Today is more of the same so to join Cathys ‘in a vase’ and Sandra ’52 week photo challenge’ of last week, my vase is full of hot colours. The vase is an old earthenware pickle pot, and this arrangement is in a bit of a pickle with stuff all over the place. I like it like this with lots of movement and hot colour. No real reds but plenty of oranges and hot pinks. Take a minute to have a look at other entries they are usually diverse and always lovely. Wimbledon has started today so that usually means more mixed weather. I shall be keeping my fingers crossed for wild card entry Katie Swan on Tuesday. Ranked 437 she won for GB in the Fed cup in Israel earlier this year and is the youngest British player to have won a Fed Cup game. Swan will play Timea Babos (44). Let’s cheer her on, go Katie!